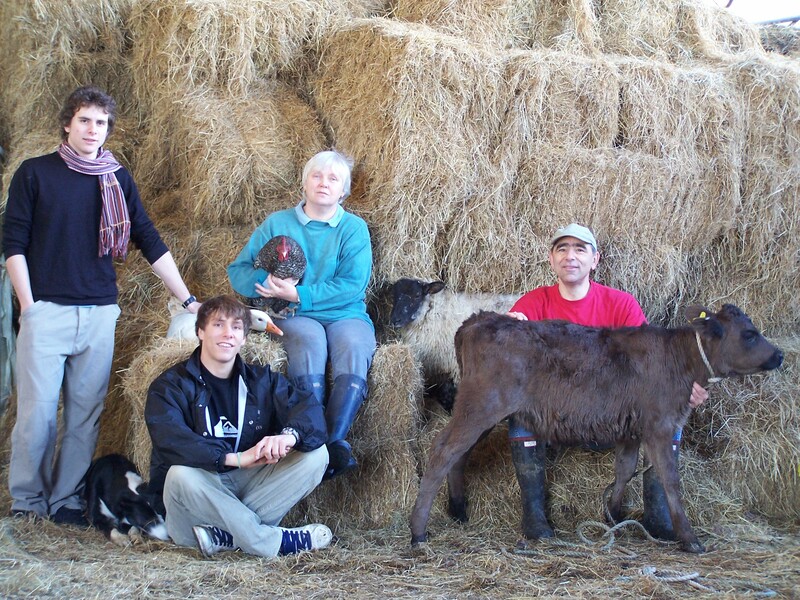 Last year Cottage Farm near Jacobstow in north Cornwall was nominated for an award in the BBC Food and Farming Awards in the ‘Farmer of the Year’ category, which rewards sustainable farming. When it made it through to the final round of judging, along with just two other farms from around Britain, the farm was featured on Countryfile (BBC1) and Farming Today (Radio 4), that was when I decided it was time to pay a visit to this unusual organic, sustainable farm to see exactly what makes it work. I arrived early in the morning to be met by Paul and Celia Sousek. Paul was out feeding his chickens and geese when I arrived so I helped him get the geese out from the barn, in which they stayed overnight, and onto the fields in front of the house. Cottage Farm is an attractive white house nestling into a shallow valley beneath a much larger neighbouring farm. Close to the house is a range of slightly ram-shackled looking structures around a yard in which cattle are being kept through the winter. 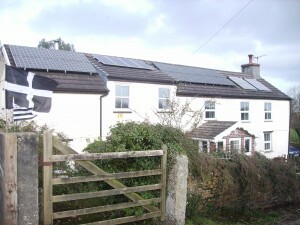 The house, adorned by a variety of solar-gathering devices, is a mixture of old and new as are so many Cornish houses with a heart of cob with a modern extension. Paul seemed very much at home here as he unhooked the various chains which kept gates together but it is a fact that Paul and Celia didn’t move to this farm or indeed Cornwall until as recently as 2005 and a more amazing fact that neither had any experience of farming until that time. Imagine being selected as a finalist for a national farming award only five years after starting out as a farmer, but maybe that is precisely why he has been chosen. We sat and had a chat in the kitchen. The newly installed Rayburn wood-burning stove gleamed in the corner whilst we sat and enjoyed a cup of tea on this chilly autumnal morning. I wanted to know what made Paul and Celia move to Cornwall and change their lifestyle. Prior to coming to Cornwall the Souseks lived in the suburbs of London. Paul was a market researcher. He once worked for a large company but was successful enough to establish his own business and worked for clients including HP, Boots and Coca Cola. His contacts in Eastern Europe enabled him to offer a unique service to these multi-national corporations as they expanded their businesses. Everything was ticking along nicely until one day, in 2005, when the younger of their two sons came home from college and declared that he had just learned about ‘Peak Oil’ and the consequences of that to life as we know it. Instead of just showing a passing interest Paul was intrigued, having heard nothing of this before, and decided to look into ‘Peak Oil’. There started a few months of detailed research by Paul and ultimately their move to Cornwall just a year later leaving suburbia and market research forever. This is the sort of story that books, television programs and dreams are made of. Leaving suburbia for the ‘good life’ and living sustainably might be easier said than done but it can be done. 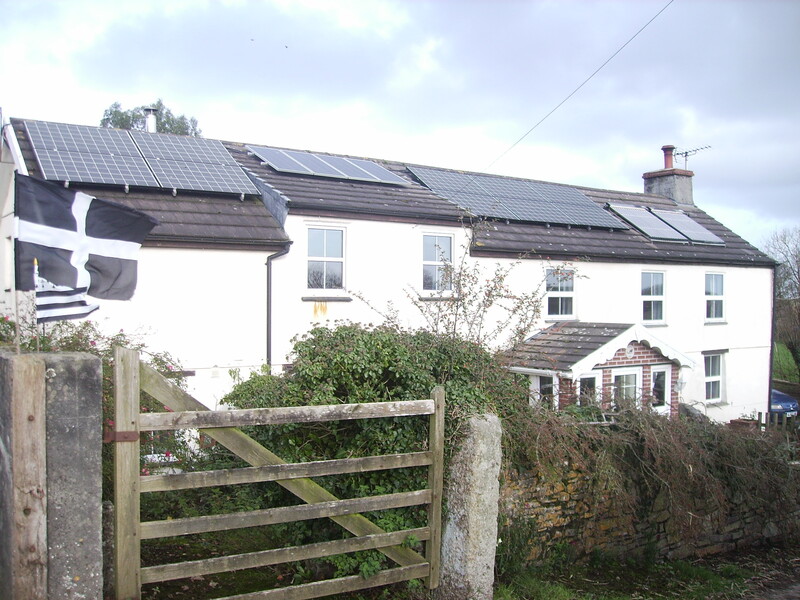 Cornwall was chosen because they had always enjoyed visiting the county and their elder son is a keen surfer but also crucially that it offers some of the best solar and wind resources in the country. In 2011 it is likely that many more of us understand what ‘Peak Oil’ is about. Essentially it is the realisation that oil production in the world must one day peak and that we must change the way we in which we live to reduce our dependence on this commodity. Our dependence on oil is absolutely ingrained in the way we live and there can be no arguing that one day we will have to learn to live without it or certainly with much less of it. We all feel the effects of an increasing demand for oil and gas when we fill up our cars with fuel or have a top-up for heating oil. The global population has just passed 7 billion people and we all want a better lifestyle, which is inevitably driven by oil. Paul said to me that the last report from the International Energy Agency, the world’s energy monitor, shows that the production of conventional oil around the world has peaked in 2006 and we are now dependent on oil from more difficult sites such as those oil fields which are found deep beneath the sea. In other words the era of cheap and plentiful energy is behind us. Energy of all types will be getting increasingly more scarce and expensive. Further more, expensive energy is limiting economic growth, making state finances unsustainable and the collapse of the world financial system likely, which is why it is all over the front pages. Others think that the global peak in oil production might happen in around 2020 whilst others suggest it will be 2035. Forecasts suggest a peak oil output of 96 million barrels of crude oil per day, but it’s all down-hill from there. Paul is convinced that the impact of Peak Oil will hit us in many ways long before 2035. He expects pension funds to be hit badly in the not too distant future and instead of doing nothing wanted to protect his family by investing in what he thinks is the most valuable asset of all: farm land. So it was that in 2005 Paul and Celia bought Cottage Farm and 68 acres of farm land near Jacobstow. The only drawback was that they had no experience of farming so for the first year they managed the land exactly as it had been managed by the previous occupant whilst Paul set about learning how to farm. He attended courses, researched renewable energy and took advice from their neighbours who have proved incredibly helpful in more ways than one. Paul’s lack of experience saw him on more than one occasion get his tractor stuck in the mud but his neighbours were always willing to drive down and tow him out. Getting stuck in the mud is a small problem when faced with the task of completely changing the way a farm works. Having spent time with Paul I can see that he is extremely determined, he won’t let problems stop him if he can see what he wants to do and this never-say-die attitude must have been called upon many times over the last six years. The overall plan for the farm was to make it self-sustaining and organic, but is it really possible to do this? One of the first things was to begin the process of converting to organic farming. This conversion lasts for two years and was completed in 2009. Organic farming prevents the use of synthetic pesticides and fertilizers so more traditional methods are used to keep the grass in good condition. Paul found a book entitled ‘Profitable Ley Farming’ written in 1947 by J. Laity of Cornwall, which describes the way in which he managed his Cornish farm profitably between the two world wars. Many of the techniques he describes are long-forgotten now since we have developed a dependency on artificial pesticides but Paul has found it incredibly useful for understanding how to manage land organically. Laity wasn’t a backward-thinking farmer, he was keen to take on new ideas of the day. Both Paul and I smiled uncomfortably at the comment Laity made in his book about looking forward to being able to use DDT (dichlorodiphenyltrichloroethane) on his farm. Looking back we now know that this was a monumental environmental catastrophe responsible for the decline in a huge number of wild animals and birds. This is exactly the sort of mistake which organic farming will help us to prevent in the future. One example of the change in strategy employed as a result of reading this book revolves around the management of the pasture. In the fields when Paul and Celia moved to Cottage Farm was a limited range of grasses dominated by rye grass which has a short root system. The ground was quite compacted and prone to water-logging. Paul has since sown a richer mix of grasses, clovers and perennials. The clovers in the ley now help to improve the fertility of the soil in a natural way and the deeper-rooted perennials help to aerate the soil to a greater depth and improve the drainage. It is hoped that, as a result of better soil management, one day he might be able to leave his herd of Ruby Red Devon cattle out through the winter. 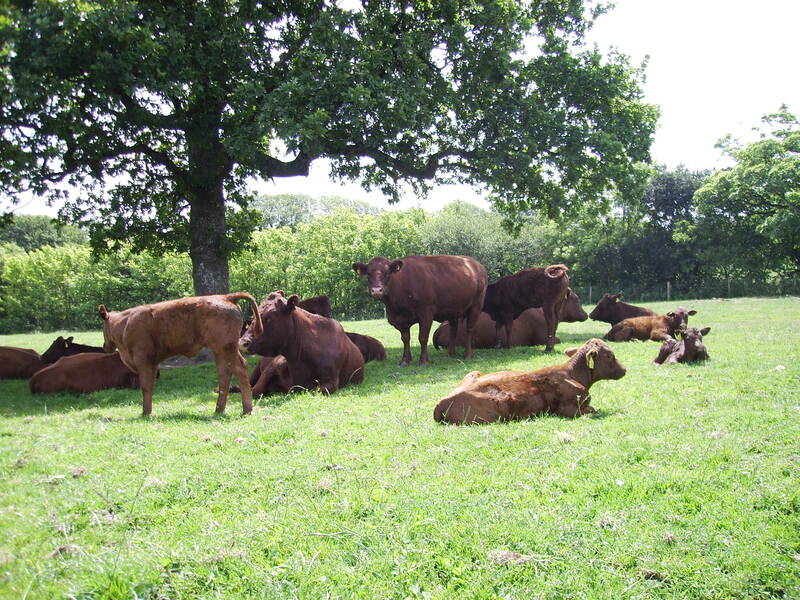 The Red Devons were chosen because they are a hardy breed and have long been used to graze the pastures locally. They also produce an excellent tasting beef, which is sold direct to the public. As well as the 60 head of cattle the Souseks also keep a flock of 72 sheep. In the early days the sheep were Suffolks but gradually Paul is changing his flock to Wiltshire Horns, which moult their coats and therefore don’t need to be sheared. It is reckoned that changing to organic and developing this system for soil management will sequester some 150 tonnes of Carbon Dioxide into the soil every year, thus preventing this escaping into the atmosphere and contributing to global warming but organic status was just a small part of the development of the farm. Paul wanted the farm to have minimal environmental impact so one important task was to begin producing his own electricity. He bought and installed a wind turbine from China. Despite having a few problems with this it has been producing electricity for over 12 months and is now generating up to 4 kilowatts per hour, much of which is fed into the National Grid. On the roof of Cottage Farm is an array of photovoltaic cells which, at the time of my visit, were just being increased to a capacity of 3 kilowatts. Alongside these are 40 thermal tubes, which help to heat water in a thermal heat store situated in the house. The wood-burning stove in the living room also has a back-boiler which also contributes to the heat store and excess electricity can also be used in the same way. The heat store is used to provide hot water for the property and can also be used to warm the radiators to take the edge of the low temperatures in winter. Wood for the Rayburn and wood-burning stove is taken from around the land. A number of hedges have been left unmanaged for many years and have mature trees in them. Paul is sequentially taking out these trees in order to reinstate the historic management of laying hedges and at the same time providing fuel for the house. Within the land there is also a two acre wood and a further 200 trees have been planted to secure the long-term production of fuel from within the farm. The use of fuel on the farm has been minimised. Simple tasks such as the installation of better insulation, draft proofing and the use of solar powered lights have been undertaken. One further innovative development is the use of waste vegetable oil for powering both tractor and car. Paul buys waste vegetable oil, which has been used in fish and chip shops and has invested in a machine which will convert this to bio-diesel. He thinks that this costs about 70 pence per litre and it works just as well as conventional diesel though he admits that in winter his tractor is a little harder to start. Obviously there isn’t enough waste fish and chip shop oil for us all to convert to this form of diesel but Paul thinks that bio-diesel could help us in the future. It is possible to grow crops that produce oil to convert to bio-diesel and though we couldn’t hope to power all of our cars with this Paul thinks it would be possible to power all our agricultural machinery if we were prepared to commit about 10% of our land to doing this. 10% might seem a large proportion of our land but when compared to an estimated 30% which was once put aside to feed the horses which used to work the land it doesn’t seem so bad. Cottage Farm now has a negative carbon footprint as it produces more power than it uses and saves more carbon that it produces. It is officially the first ‘superhome’ in Cornwall having met the requirement of reducing their carbon emissions by at least 60%. In fact their emissions have been reduced by an amazing 110% and if Paul is successful in his desire to increase the potential for harnessing the power of the wind with some new turbines this figure will be still further improved. Other plans in the pipeline, which would improve the self-sufficiency of the farm, include producing methane from cattle slurry and growing a crop called switchgrass to provide bedding for his animals through the winter. I wouldn’t suggest that the journey from suburban living to organic sustainable farming has been without problems and challenges but I have been amazed by the tenacity with which the Souseks have approached this conversion and the power of their convictions throughout this period. I can’t imagine that everyone will have the energy and determination to follow in their path but I hope that the inspirational changes they have made to secure their future can have an impact on the way we all think about power, Peak Oil and making a sustainable future for our society.